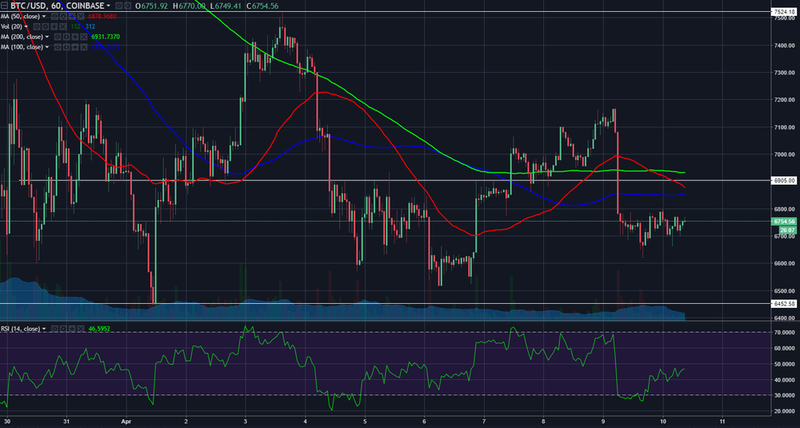 Bitcoin (BTC/USD) has been consolidating since falling from $7120 to almost $6600 during the 4/9 session. It looks the market might have built a price bottom in the short-term, which opens up a possible short-term bullish attempt. As we can see in the 1H chart, price action has been essentially sideways. Since the prevailing mode is bearish, we can say the market is sideways-bearish. Within this context, we can still see some choppiness, and a possible rally come out of the session-long consolidation between $6620 and $6800. If there is indeed a rally during the 4/10 session, we should monitor the $6900 area. This has been a support/resistance pivot area. If the market holds under $6900, forgiving some near-term breach above it, we can maintain a bearish outlook for bitcoin, at least towards $6450, which is the current April low. A break below $6450 would then open up the $6000 level. This is the bearish scenario for bitcoin we have been anticipating. But for now, let's anticipate a little choppiness and a possible rally to $6900.